The word Tibet means Tibet is beautiful even today. Tibet is the roof of our world, Tibet is the home of nature and Tibet is also the heart of spiritual seekers, so Tibet became an essential journey for Travelers. Journey to Tibet can change you if not outwardly, definitely inwardly. The blessings of beautiful nature and great realized beings are endless. The white snow mountains and dark brown mountains, the green and blue color lakes with fresh, clean rivers have made Tibet as their home. These beautiful nature are the leading destinations for Travelers. To see these beautiful natures, it is essential to know the highlight scenic spots so today Tibet Travelers would like to share the scenic spots for Travelers. Most of the scenic spots in Tibet will leave OMG moments for Travelers. Scenic Spots are the best places to see the view of the beauties in Tibet. 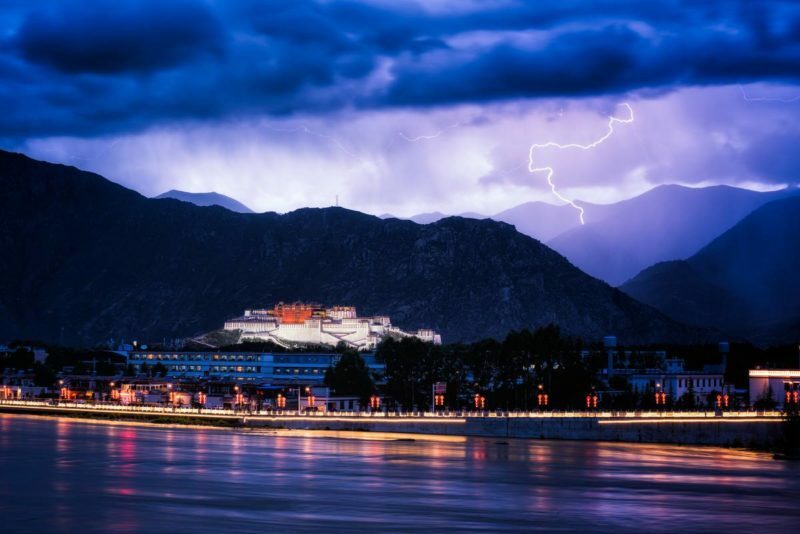 Lhasa is the starting point for Travelers traveling to Tibet. The altitude of Lhasa is 3650 meters. Not too warm and also not too cold. One of the favorite cities in our world. Lhasa meaning land of god will leave an excellent feeling for Travelers. The Lhasa city is not as big as many other cities outside of Tibet. Lhasa has its uniqueness with the majestic Potala Palace. The best place to see the view of Lhasa is near the Sera Utse retreat area. Travelers can hike from Pabunka monastery to Dode valley to see the stunning scenic viewpoint of Lhasa or Travelers preferring not to hike can drive the vehicle to the Purchok retreat area near Dode valley. The high pass is around nearly 4000 meters, and it can give Travelers a breathtaking view of Lhasa. Another scenic spot to see the view of the front of Potala Palace will be the new scenic spot at the other side of Lhasa Kyichu river. The view is beautiful. Lhasa is accessible via flight, train, and overland. Gyantse is known as one of the most ancient style towns in Tibet. The altitude of Gyantse is 3950 meters. The drive from Lhasa to Gyantse is 270km with about six hours driving duration, and the journey from Gyantse to Shigatse is 9km with roughly one-hour twenty minutes driving duration. The stunning view of Gyantse town seen from the Gyantse old fort Dzong. The fort was reconstructed a few years back. From the fortress of Gyantse town, Travelers can see the view of Gyantse town with the seven stories Kumbum stupa and Palkor chode monastery. At the moment, Gyantse is accessible only via overland. Shigatse is the second most significant cities in Tibet after Lhasa. The altitude of Shigatse is 3900 meters. Situated 280km from Lhasa and 150Km from Lhatse. Shigatse is the nearest city to the Mount Everest area. The scenic view of Shigatse city seen from the Shigatse Old fort Dzong. The fort was reconstructed a few years ago. Travelers can hike from the Tashilhunpo monastery lingkor route and reach the old fortress Dzong. Travelers can also travel the fort shorter path via the old local market. Shigatse is accessible via flight, train, and overland. The nearest lake from Lhasa is Yamdrok Lake. Yamdrok Lake situated 90km from Lhasa with a driving duration of 2 hours. The best scenic view of Yamdrok Lake seen from the Gambala Pass, at the elevation of 4900 meters. At the moment, Yamdrok Lake is accessible only via overland. The most popular traveling routes in Tibet is Mount Everest. They are five scenic spots to see the stunning view of Mount Everest. The first scenic view of Mount Everest seen from Gyatso la pass at the elevation of 5200 meters. Gyatso la pass situated 30-40km from Lhatse town. The second scenic view of Mount Everest seen from Geu la pass, also known as Gawu la pass. Travelers can see five mountains above 8000 meters. The mountains include Mount Everest (8844 meters, 29002ft) Mount Makalu (8463 meters, 27825ft) Mount Lhotse (8516meters, 27940ft) Mount Cho Oyu (8188 meters, 26906 ft) and finally Mount Shishapangma (8027 meters, 26289ft) This is the best view scenic point of Mount Everest. To see the sunrise from the Gawula pass is one of the reasons Tibet Travelers recommend Travelers to stay a night in Pelber town near Sheger, also known as New Tingri. The third scenic view of Mount Everest summit seen from the Pasum village. Pasum is my hometown where my mother is living at the moment. The small town is a great place to stop for a cup of yak butter tea and see the summit of Mount Everest. Pasum situated around 35km from Rongbuk monastery the last and final viewpoint of Mount Everest. The fourth scenic view of Mount Everest can be seen from the Rongbuk monastery, which is the last and final viewpoint of Mount Everest. We highly recommend Travelers for the sunset view when the color of Mount Everest become yellow, orange, and finally red. The fifth scenic view of Mount Everest can be seen from the Old Tingri. This is recommended for Travelers traveling to Nepal after Tibet. Travelers can once again see the view of Mount Everest, Mount Cho Oyu on the way to Nepal border near the Nyalam Tongla pass. At the moment, Mount Everest is accessible only via overland. In Buddhism, Kailash was known as the palace of Lord Buddha Korlo Demchok, also known as Buddha Chakrasamvara. In Hinduism, Kailash is known as the palace of Lord Shiva. Every year many Travelers will travel to Mount Kailash for blessing and adventure. The nearest town to Mount Kailash is known as Darchen. From Darchen we cannot see the view of Mount Kailash because it is too much attached to the mountain nearby. The first scenic spot of Mount Kailash is Gangdrak monastery. The short hike from Darchen town to Gangdrak monastery is around one hour. The second scenic spot of Mount Kailash is from the Chiu bird monastery near the Manasarovar Lake. Mount Kailash is accessible via a flight at Ngari city and overland from Lhasa. Manasarovar Lake is accessible via a flight at Ngari city and overland from Lhasa. The duration from Lhasa to Namtso Lake is 240km, with the driving of 5 hours. Namtso lake is the home of grassland and nomads. The best view scenic point of Namtso Lake is the small hill near the Tashi do monastery. Namtso Lake is accessible via a train to Nakchu and overland from Lhasa or Golmud. Sakya monastery is the authentic monastery in Tibet. Loved by many spiritual seekers. The Sakya town situated around 50km from Lhatse town, and 150km from Shigatse. The best view scenic point of Sakya can be seen from the northern hill of Sakya. At the moment, Sakya is accessible only via overland. The best view scenic point of Mount Namchak Barwa can be seen from the Serkyam la pass near the Lulang green town. Traveling to Tibet is a dream come true to Travelers. To make the most of your traveling to Tibet is essential. Even though Tibet Travelers Tibetan English speaking Tour Guide and Tibetan safety Tour Driver knows most of these highlight scenic spots in Tibet. To boost and to remind our Travelers about these highlight spots, Tibet Travelers has written this article. We hope this piece of information is useful for Travelers traveling to Tibet. Thank you for reading Tibet Travelers article on highlight scenic spots in Tibet. 89 queries in 0.269 seconds.